Meyer Fagelman was born on May 19, 1912, in Russia, to Harry and Fanny (Nemoy) Fagelman. He married Grace Denhoffer in Detroit, Michigan, on October 14, 1940, when he was 28 years old, previously he had been married to Lilian Axelrod. 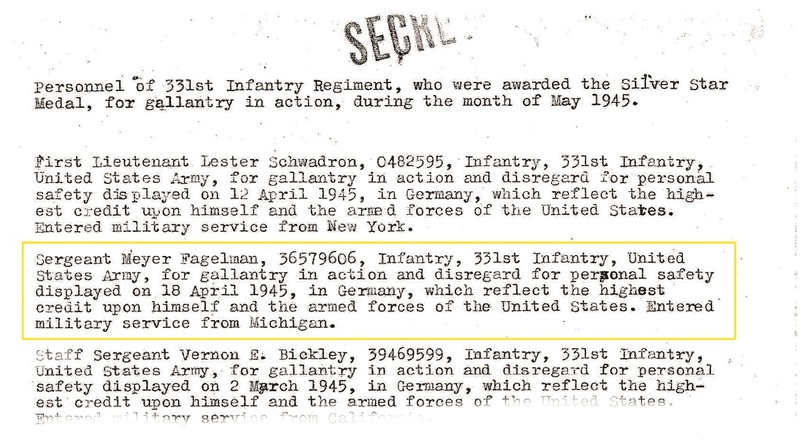 Meyer Fagelman (#36579606) was assigned to Company A of the 331st Infantry Regiment. He was awarded with the Silver Star Medal for action on April 18, 1945 while his company was in the area of the Elbe River, Germany. After Action Reports for Company A, 331st Regiment from April 18, 1945, the day Meyer Fagelman earned his Silver Star Medal. Meyer Fagelman died on May 25, 2001, in El Paso, Texas, at the age of 89, and was buried there. If somebody has some more information on Meyer Fagelman, please don't hesitate to contact me! !